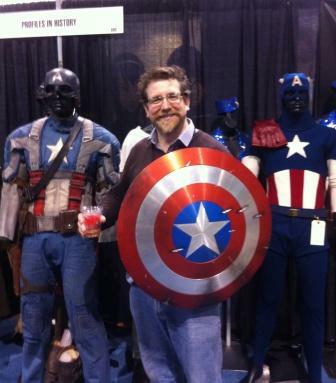 James Bacon, while doing prep at the Chicago Comic and Entertainment Expo, got to hold one of the real shields from Captain America. Those shields and many other movie props are part of Profiles in History’s Captain America Auction at C2E2 on April 14. This entry was posted in Like Show Business and tagged Captain America, James Bacon, Profiles in History by Mike Glyer. Bookmark the permalink.